It lasted over 1,500 days and was without parallel. World War One threw the globe into a war of unprecedented horror, fought with terrifying new weapons, and of death on an industrial magnitude, a war that involved so many nations and reached into the very fabric of society. The war of 1914 – 1918 changed the world and shaped the twentieth century. The Clever Teens' Guide to World War One covers all the major facts and events giving you a clear and straightforward overview: from the pre-war tensions, the assassination that sparked the war to its bloody conclusion four years later. 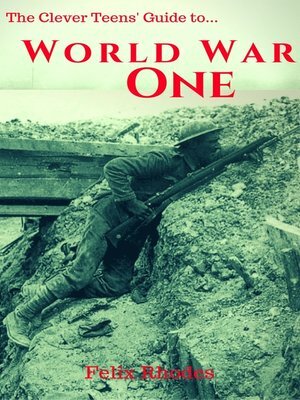 Read about the huge battles on the Western Front, the Eastern Front, the war at sea and in the air, and the war in Africa and the Middle East. Ideal for your "clever teenager".